You will be treated like Maharaja & Maharani on welcome by garlanding, Tikka and turban with glass of wine. The Capital city of modern India a city known for its rich valorous and exotic history. Once the fabled city of the heroes of the Mahabharata and ruled by the Rajputs before they were displaced by foreign invaders. 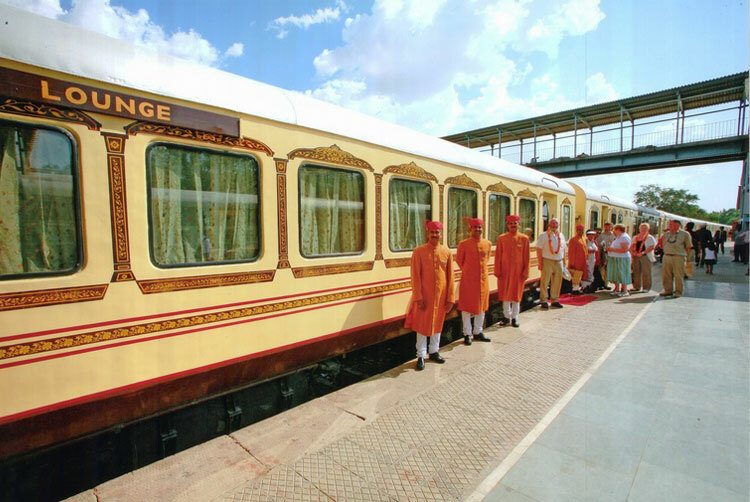 The tour starts in the evening with a ceremonial welcome aboard the Palace on Wheels at Safdarjung New Delhi. You will be introduced to your fellow travelers. Feel free to explore your new palace, and acquaint yourself with its various facilities. Relax with a drink at the bar. Dinner will be served on board in its two restaurants. Your tour began at the Hawa Mahal Palace of wind followed the amazing Jantar Mantar-“Astronomical Observatory” are to be explored at leisure. The home of the erstwhile rulers. The city palace now a museum of full royal splendor. Jaipur also offers a great shopping experience since the city is the countries capital as far as handicrafts are concerned. After lunch visit of Amber fort the best example of “splendid fusion of Rajput and Mugal style of Architecture”. a) Lunch venue at famous Amber Fort. c) Visit of Albert Hall. d) Dinner, Bar-be-que, Folk Dance at 5 star Hotel Jai Mahal an old palace of Rajput rulers. The breakfast is to be served in Hotel Vinayak in peace and tranquility-Return back to Palace on Wheels. a) Sightseeing of Jhoomar Baori- It was a hunting lodges of Jaipur ruler Sawai Madho Singh. The best location to take picture of the forest. b) Visit to Jogi Mahal-A former forest guest house from where you can view the picturesque scenery of Padam Talab. c) Leisurely Break Fast at Vinayak Hotel at lush green lawns along with fresh aroma of the jungle trees. a) Light & Sound show at fort. named Panna Dhai who saved the life prince by scerified her own son) there you can enjoy with cultural programme, music & Bar-Be-Que. tiger wild boar & other wild life. It is the only calm & screen place to enjoy breakfast with the nature. of Lake Palace, Jagmandir and can enjoy fresh breeze of Pichola Lake. having a museum of crystal glass furniture, crockery, chandilliers of old time. d) Boat Ride and back to train. the full of village atmosphere. b) Enjoy Rajasthani Food with traditional ethnic music. c) Evening Tea, Sun set & Dinner with Bar-be-que, at Samdhani. Fort stands on strong and wide walls, which are 20 to 120 feet high and 12 to 70 feet thick its gigantic structure and finely carved intricate sculpture are a treat for eye.The royal structure boast their own saga of security and beauty the perl palace has a delicately carved stone screen, umaid vilas displays the Rajput miniature paintings and the ajit vilas exhibits musical instruments and the royal costumes. Shopping of local handicrafts. “Umaid Bhawan Palace worlds finest and largest palace in the world Maharaja Umaid Singh utilized the services of a well known Edwardian architect, henry vaughan lanchester for the construction of this palace. There are 347 rooms in the palace that boast about its grandness and splendor the central dome that has become the identity of the palace 110 feet high. The royal family in still lives a part of the palace also having the old clock museum. ”The Keoladeo Ghana National Park one of the finest bird sanctuary in the world was developed by a royal edict when dykes were created so that water could be canalized for the hunting preserve as the Maharaja of Bharatpur wished to create. Break Fast at Bird Sanctuary-Nominated a world heritage site it was declared a National Park in 1983. This 29 Sq. KM park is one of the world\'s greatest heronries. It shallow, fresh water marsh attracts thousands of migratory birds. A visit to the world\'s most well known monument and well worth its fame. a) Lunch at Palace Hotel. b) Light & Sound culture Programme in the evening. c) Gala Dinner at Hotel Mughal Sheraton.